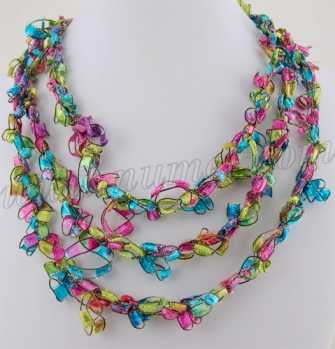 These crocheted ribbon necklaces are absolutely dazzling and sure to be an instant hit with everyone! They look like shiny beads but are light-weight and easy to make. Make one in every color to match your wardrobe. US Size P16 (11.5 mm) crochet hook if using combinations of 2 strands of yarn. Length of necklace can be varied by varying the number of crochet stitches. Thickness of necklace can be varied by varying the number of strands. This is a pattern for a loopy-look ladder ribbon necklace. This pattern works best with Ladder Ribbon Maxi or East Track II. Use I9 (5.5 mm) or J10 (6 mm) crochet hook. Note: SPACE refers to the space between the colorful panels on the ladder ribbon. *Insert crochet hook into the next available SPACE on the ladder ribbon, do not pull yarn through, skip next 3-4 spaces, insert crochet hook into next SPACE, pull yarn through both stitches. (Note: the more SPACEs you skip, the bigger the loop will be). Rep * until strand measures 22" (or desired length). Slip stitch in first stitch to form a loop/strand. This forms the first loop/strand. Repeat as for First Strand but work till strand measures 25" (or 3-4" longer than First Strand). Slip stitch in first stitch to form a loop/strand. This forms the 2nd loop/strand. Repeat as for First Strand but work till strand measures 28" (or 3-4" longer than 2nd Strand). Slip stitch in first stitch to form a loop/strand. This forms the 3rd loop/strand. Bind off. Weave in all ends.